Vietnam's steel market leader exhibiting a range of products at April 19-23 trade fair in central city. The Hoa Sen Group is participating in the Vietbuild Da Nang International Exhibition on April 19-23 in the central city’s Hai Chau district, which will feature more than 300 enterprises. In order to introduce its products to customers, especially those in the central region, Hoa Sen is exhibiting three main products: Hoa Sen steel sheet, Hoa Sen zinc tube, and Hoa Sen plastic pipe. With a 54 sq m booth, the Group will attract many visitors to see and test its products. Mr. Huynh Ngoc Tho (white shirt), Chairman of Da Nang People's Committee visits Hoa Sen Group's booth. For many years now, the Hoa Sen Group has held the leading position in Vietnam’s steel market, with a 33.1 per cent market share, and was second in steel pipes in 2016, with a 20.3 per cent market share, according to figures from the Vietnam Steel Association. In terms of plastic pipe products, Hoa Sen has made great progress. Though entering the market after other brands, with four core elements - quality products that meet international standards, reasonable price, on-time delivery, and sound after-sale services - Hoa Sen’s plastic pipe products have risen to the No.3 position in the Top 10 most popular plastic pipe products in the country. The group has plastic pipe factories in all three regions of the country - the north, the central region, and the south - which are equipped with modern machinery for stable and high-quality products, thus reducing logistics costs to meet the needs of customers in each region. In recent years, Hoa Sen’s plastic pipe business in the south has developed quite strongly. Its strategy therefore is to promote the markets in the north and the central region, creating growth from expansion activities. In order to implement the strategy, Hoa Sen continues to build new plastic pipe manufacturing facilities, improving its production capacity and optimizing supply to the market. 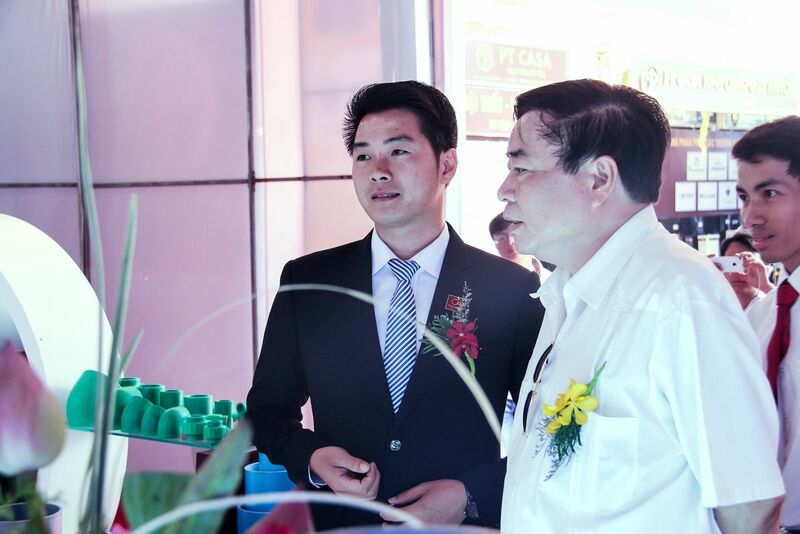 Specifically, in the central region, Hoa Sen is now building the Binh Dinh Plastic Pipe Factory at the Nhon Hoa Industrial Zone in Binh Dinh province, which is expected to be completed in December. 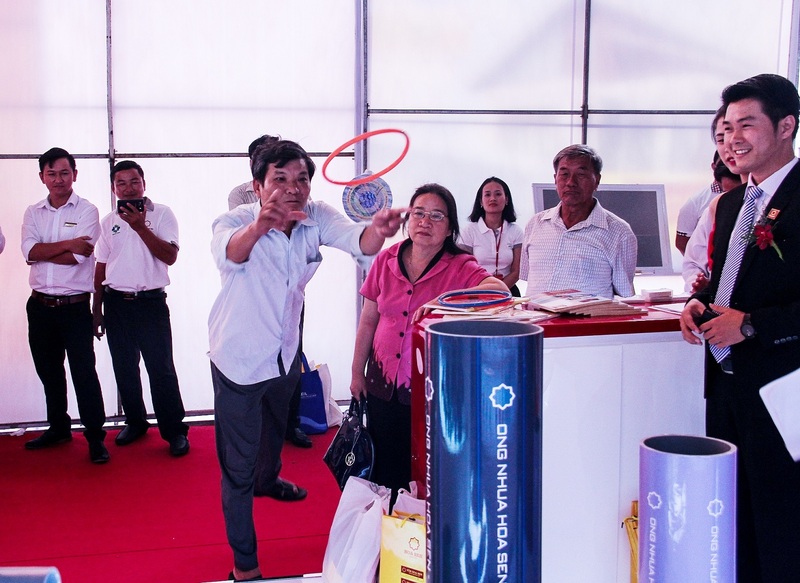 Hoa Sen’s plastic pipe products at the exhibition. In the north, meanwhile, it has invested in the Hoa Sen Ha Nam Factory at the Kien Khe Industrial Zone I in Ha Nam province, producing two main products, plastic pipes and steel pipes, divided into two phases. The factory has now completed its first phase and launched its first commercial products in February. It is now investing in a steel pipe production system, with the first products expected to be released in June. Over the last 16 years, the Hoa Sen Group has been striving to bring the best products to customers nationwide. Thanks to the serious implementation of its sales policies at branches, it has become increasingly closer to customers in all three regions of Vietnam. To expand the Hoa Sen brand, the Group is rapidly deploying plans to expand its distribution network, especially in the north, by opening more than 100 branches this year and 500 nationwide in 2018. It is also constantly expanding its production systems in all three regions to improve capacity, reduce logistics costs, and increase product competitiveness.